SAVANNAH, GA (WJCL) – Ladies and gentlemen, start your beds! 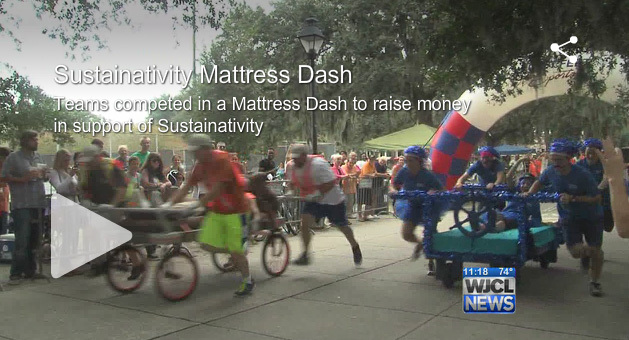 Sustainativity’s first annual Mattress Dash took place in Forsyth Park today. Teams paid $150 to compete against other teams. Each team must create a structure that holds a mattress that also has 4 wheels. 4 team members push the bed with one rider 150m. Teams were encouraged to use green materials for their creations. Team “Bed of Roses” used old newspaper as roses on their structure. There were 11 teams at the event, but only four winners. The overall winner was Thunderbolt Marina, Judge’s Choice went to Gulfstream, People’s Choice went to Bed of Roses and the Historic Savannah Foundation had the Greenest structure. Sustainativity raised about $5,000 during the event.